Medusa Mining has struggled to keep its processing mill at full capacity with this issue looking likely to continue in the future. The Diwalwal project may provide a possible solution to the under-utilized mill problem if a sizeable high grade resource is able to be determined. If a deal was to be reached with the owners of the Diwalwal project, blending Medusa's ore with Diwalwal's ore would result in lower cash costs for Medusa's mill. Medusa Mining is a gold mining company who owns the Co-O mine in the Philippines. For many years it has struggled to bring enough ore to the surface from its sole underground mine to run the Co-O mill at full capacity (2500 tonnes per day). This has caused higher cash costs due to the mills high fixed costs being spread over fewer ounces as otherwise could be. A newly installed service shaft, which has recently been commissioned at the Co-O mine, will allow the Level 8 shaft to be solely used to transport ore. However, the mill will still not operate at full capacity particularly with the service portals coming to the end of their productive lives. More information on the Co-O mines shaft capacity and future haulage rates, have been detailed in a previous report. To combat the under-utilized mill problem, Medusa has been exploring nearby gold prospects. Notably, the Royal Crown Vein and Durian prospect have recently been assessed as providing potential growth for the company, however no major announcements have been made in relation to these prospects. An alternative option would be to explore potential opportunities with another nearby, sizeable gold prospect who currently has no accessibility to a mill. This is where Tribune Resources recently acquired Diwalwal gold project could come in to consideration. The Diwalwal gold project is a low sulphidation epithermal gold project only 40 kilometres from Medusa Mining’s Co-O processing mill. Very little modern day mining and exploration has been conducted at this project, which makes the project prospective for some rich veins of gold. Even though Diwalwal has no JORC 2012 compliant resource to speak of, drilling was conducted in 2006 where 21 diamond core drill holes were completed on one of the vein systems named Balite. In 2017, Prometheus, the previous owner in the project, re-logged the existing drill cores, re-sampled some of the samples of the drill cores and re-mapped an underground mine tunnel called the Victory Tunnel. Judging by the very sizeable $30 million (NYSEARCA:AUD) price tag Tribune Resources paid to acquire this project in December 2018, a fairly large, high-grade resource looks highly possible. Tribune Resources is currently focusing on two vein systems named the Balite and the Buenas-Tinago veins. The Balite vein has widths of between 2.5 to 6 metres with a typical gold grade of 10g/t in the mined faces. Buenas-Tinago has widths of 1 to 4 meters with a typical gold grade of 8g/t in mined faces. Tribune has been drilling the Balite vein in February and March and is aiming for a JORC 2012 resource of 1.5 - 2 million tonnes of ore grading between 7.5-9g/t for 0.35-0.56 million ounces of gold. The Victory Tunnel has enabled Tribune to access this ore body to drill out a resource. They will be drilling along a strike of 550 metres and 200 metres of vertical extent from the 600 m level down dip to 400 mRL. Where does Medusa come in to the picture? The Philippines is not an overly favorable mining jurisdiction to operate in. The Philippine President has openly spoken out against mining, mainly open pit mining in the Philippines due to the environmental costs. Illegal mining is also a serious issue as are the lack of rules and regulations within the mining sights themselves. As such, violence and instability is a concern in the mining town of Diwalwal. This, combined with having to build a new mill to process your gold, the shareholders of Tribune Resources may be hesitant to allow a capital outlay of this size due to the political and social risks involved. A far more safe and cost effective way of monetizing this asset would be for Tribune to mill Diwalwal's ore through Medusa's Co-O mill. The Co-O mill has always struggled to run its mill at full capacity with a company presentation in October 2018 stating that its mill has only been running at 55% capacity, which equates to under 1500 tonnes a day or 133,000 tonnes for the September 2018 quarter. There is potential for Medusa’s Co-O mine to see a temporary increase in mined ore hauled to the surface due to the service shaft being fully operational and the Level 8 shaft being solely used to transport ore during the 2019 calendar year. However, this additional hoisting capacity may be short lived as the other shafts, Baguiao and Agsaio and service portals will have reduced capacity as the ore on these levels will be exhausted. The Royal Crown Vein and the Durian prospect could also increase mined ore, however there are far too many unknowns with regards to the size and grade of these resources as no announcements have been released so far. This therefore leaves Medusa with mining capacity of only 1500 tonnes per day for the foreseeable future. If Diwalwal’s ore were to be processed through Medusa’s Co-O mill there would be a high chance that the mill would run at full capacity. This would in turn spread the mills high fixed costs over more ounces of gold, therefore reducing cash costs. 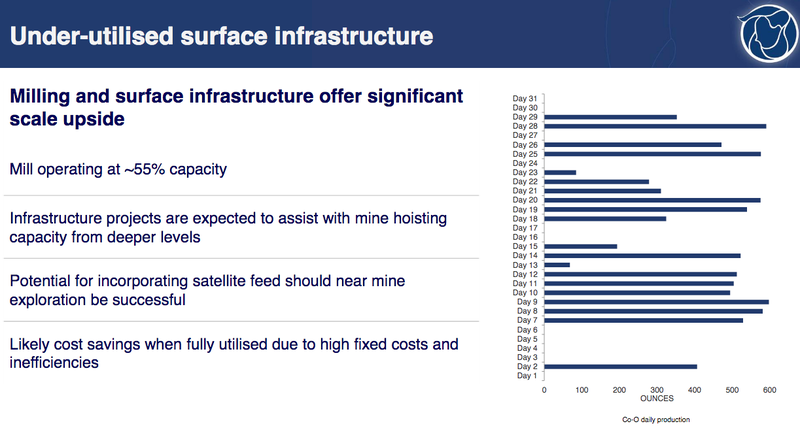 The following outlines a few assumptions relating to Diwalwal’s resource size, grade and mining capacity. Let us presume that Tribune does find a mineable resource target of 1.5 million tonnes grading 8g/t of gold. Let us also presume that they could extract around 1000 tonnes per day from the Balite vein. If this ore were to be blended with Co-O’s 1500 tonnes per day of mined ore grading 6g/t, the mill would be running at full capacity. The blended ore would contain a milled grade of 6.8g/t. If the mill can continue with its 95% recoveries, Medusa would produce around 47,000 ounces per quarter or 188,000 ounces per year. Not only would the economics of the mill change but the project would also be de-risked to an extent as there would be 2 mineable deposits. It must be noted that Diwalwal would have to drill out a sizeable high-grade resource before any kind of joint venture could be signed. Furthermore, it is unlikely that Tribune would be interested in receiving anything less than 70,000 ounces per year due to the company having an 80% economic interest in Diwalwal. If a sizeable high grade resource is drilled out at the Balite vein, Tribune might have some negotiation power, particularly if the two companies decide to go down the joint venture path. If a joint venture did occur, and Tribune was to receive at least 70,000 of the 188,000 ounces of total production, they would require somewhere between 35-40% of the joint venture. This would still be beneficial for Medusa as they would be receiving an additional 15,000+ ounces of gold per year and would be producing these 188,000 ounces at a substantially lower cash cost. The Co-O mine also has scope to reduce All In Sustaining Costs (AISC) without the help of the Diwalwal project. The sustaining costs make up around 45% of the AISC figure which is quite high for a mining operation. This high figure could be attributed to the high development costs per ounce produced. The mine workers sometimes mine gold ounces outside of the reserve. At times this pays dividends if the grade is higher than the reserve but at other times, it doesn’t, which reduces the overall grade mined. It is far too early to determine whether the Diwalwal gold project would be a great fit for Medusa’s processing mill as Tribune still needs to establish a sizeable high-grade resource. Medusa might be looking at other mines to feed its mill, but Diwalwal looks like a very promising project. Time will tell whether Medusa Mining can come through with the goods and fully utilize its mill and reduce its cash costs in the future. Disclosure: I am/we are long MDSMF. I wrote this article myself, and it expresses my own opinions. I am not receiving compensation for it (other than from Seeking Alpha). I have no business relationship with any company whose stock is mentioned in this article.